PURCHASE AT YOUR OWN RISK! MAKING THE LINUS PAULING VIDEO THE MOST DANGEROUS TAPE TO OWN IN AMERICA. Following the publication of Linus Pauling's book Vitamin C and the Common Cold, vitamin C consumption rose 300% in the United States and life expectancy increased by 6 years for those who took his advice. Again, he bypassed the medical establishment who are ignoring a major medical discovery. Pauling's video -- Heart Disease: Cause and Cure -- provides basic information on the supersafe treatment that neutralizes lipoprotein(a) -- unquestionably one of the great medical discoveries! Linus Pauling recommended a high amount of two essential nutrients for the maintenance of the intima of arterial walls and for a reduction in plaque caused and laid down by a variant of LDL cholesterol: lipoprotein(a) or Lp(a). The Pauling/Rath theory attributes plaque formation to lesions in the intima caused by insufficient vitamin C in the diet. In other words, plaque formation is a healing process. In all cases, large amounts of vitamin C are warranted to support healing of the intima. Lysine (and proline) is theorized to attach to the lysine and proline receptors of the Lp(a) molecule, and thus substitute for the Lysine and proline exposed on the arterial wall after injury to the intima. Note: Individuals with serious illness should not self-medicate and would be wise to seek the guidance and counsel of a nutritionally oriented physician. 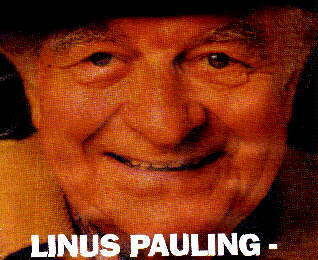 Linus Pauling filmed the video to tell us that the beneficial effects of his therapy are dosage dependent, and that products without high potency are not based on his discovery or recommendations. PROPHYLACTIC/PREVENTION: Linus Pauling recommended that every adult should take at least 3 grams of vitamin C, and 1-2 grams of L-lysine every day as a preventative against heart attacks and stroke. MILDLY THERAPEUTIC: And those who are considered high risk, (that is, anyone whose mother, father, sister, or brother, has had a heart attack or stroke), should take at least 3 to 6 grams of vitamin C and 2 to 3 grams of lysine per day. THERAPEUTIC: Pauling recommended that those who have had a heart attack or stroke should take at least 6 or more grams of vitamin C and 4 to 6 grams of lysine. These, together with a general anti-oxidant recommendation which included vitamin A and E, were his specific recommendation for the prevention and treatment of cardiovascular disease. After his death, the Lp(a) proline binding sites were discovered and Dr. Pauling's associate, Matthias Rath, recommends proline as a "binding inhibitor" partner with lysine. We have noticed since 1995 that patients with advanced disease, and who follow Pauling's recommendations (which are equivalent to 2-3 Jars monthly of the Tower HEART TECHNOLOGY Ascorsine Brand Drink Mix) stay on the highest dosage for 3-6 months. Former patients on 3 Jars tell us they reduced to 2 jars in that period. Almost all patients reduce their consumption to 1 to 1.5 jars per month after 1 year. Chest pain reportedly returns below this does. Why is unknown. Former patients with chest pain faithfully remain on the 1 to 1.5 Jar maintenance dose indefinitely. Mr. Eli Raber a patient declared "terminal" by his doctor in 1996, was the very first Heart Technology customer and is still on monthly autoship. Illinois, Texas and Arizona residents add 7% ($3.50) state sales tax. "Sometimes the turbulence of swiftly moving blood or some other mechanical trauma can cause a permeability or porousness of arterial walls -- allowing infiltration of cholesterol and consequent plaque formation. The integrity or soundness of arterial walls thus acts as a deterrent to develop- ment of atherosclerosis. This soundness depends largely on vitamin C because that nutrient is responsible for the formation and maintenance of their arterial framework and ground substance. The framework consists primarily of the interlacing fibrous protein called collagen, and the ground substance is a biologic cementing medium that binds the collagen into a sturdy unit." The structural picture is completed by an intercellular "glue" that holds connective tissue, muscle, and innerlining cells together. To demonstrate how restricting C can contribute to ground substance injury, G. C. Willis first worked with guinea pigs. Then, collaborating with Dr. Fishman, he autopsied human aortas for ascorbic-acid contents. Arterial depletion was greatest in areas of the artery subject to extra mechanical stress (such as where they branch or divide). It could also be related to the duration and extent of the victim's illness. Willis and Fishman made note of the fact that a "gross and often complete deficiency of ascorbic acid frequently exists in the arteries of apparently well- nourished hospital autopsy subjects. Old age seems to accentuate the deficiency." "Willis decided to find out whether vitamin C would reverse atherosclerosis in human beings using serial arteriography. This entails injecting a chemical that makes the arteries visible and them taking a series of x-rays. Subjects were divided into two groups: atherosclerotic patients given 500 mg of ascorbic acid three times each day and controls who weren't. In the C-treated group, 60 % of the subjects showed a reduction of plaque size. In the untreated group, there was no reduction in plaque size; in fact, in 50 percent of the controls, plaque size increased." More than five years ago, Nobel prize winning scientist Linus C. Pauling, along with his then associate Dr. Matthias Rath, MD, contributed to the discovery that ordinary LDL (bad) cholesterol is not really the cause of heart disease (occlusive cardiovascular disease) in human beings, any more than calcium or other components that accumulate in atherosclerotic plaques. Dr. Rath was instrumental in determining that the real culprit in human heart disease was a peculiar variant of LDL called lipoprotein(a). Lipoprotein(a) is an LDL particle with an additional adhesive protein apo(a) wrapped around it that makes it stick to the walls of injured blood vessels. Pauling and Rath discovered that lipoprotein(a) is found mainly in animals that do not produce vitamin C in their bodies, such as human beings. High cholesterol, specifically LDL (bad) cholesterol, is not the cause of cardiovascular disease. The newest research tells us that lipoprotein(a) will cause cardiovascular disease ten times more likely than high LDL (bad) cholesterol. This fact was revealed during a recent reevaluation of the Framingham Heart Study, the largest cardiovascular risk factor study ever conducted. Today lipoprotein(a) has been confirmed as the leading risk factor for many forms of cardiovascular disease. Then Dr. Pauling and Dr. Rath invented "non invasive" therapy for preventing plaque build-up. This therapy is based partly on Nobel prize winning discoveries on how and why lipoproteins adhere to the walls of damaged human blood vessels. for reversing heart disease without surgery. Dr. Pauling lectured on this development for years prior to his death. In 1992 one of these lectures was filmed and is now offered on VHS video tape. No prescription drug has ever been shown to help prevent heart disease similar to [vitamins A, C and E]. These results and those of countless other studies are so clear that anybody questioning the value of vitamins in the prevention of heart disease can safely be considered uninformed." Furthermore, according to Dr. Rath, all blood risk factors known today in clinical cardiology can be neutralized by vitamin C and other essential nutrients. If you discover other viable Pauling Therapy Products please let us know! Secure Order Form Order a Sample Jar of Heart Technology, Lysine, etc. We believe, based on our reading of the literature, that the standard blood assays that break down "cholesterol" readings into various lipoproteins and apo-proteins, do not report Lp(a) or apo(a), i.e. small "a". Furthermore, these readings that identify the apoproteins A1, A3, etc., are reporting "good" apoproteins associated with HDL (good) cholesterol. Be aware, it is unlikely you will know your Lp(a) and/or apo(a) blood levels from standard tests used in clinical practice. The A's that are reported are nothing to worry about. Based on his clinic studies, Dr. Pauling advises, "if you have more than 20mg/dl of lipoprotein-(a) in your blood it begins depositing plaques causing atherosclerosis." Studies show that special diet does not influence lipoprotein(a) blood levels. Dr, Rath claims that vitamin C and vitamin B3 (niacin) can lower blood levels of lipoprotein(a). The Pauling/Rath studies with gineau pigs showed that reducing vitamin C levels stimulated the liver to produce more Lp(a) Other short-term studies have not shown that increasing vitamin C necessarily decreases Lp(a) production, although it might over time. New Mice strains created by Lawrence Livermore National Labs that produce apo(a) A complete surprise!